The SAM PuttStation* is the ideal extension for PuttLab indoor installations – the perfect tool for studios and academies as well as retail golf shops. 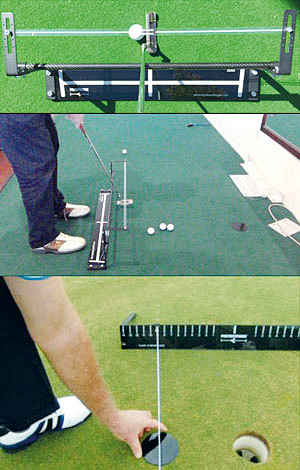 The biggest advantage to using the PuttStation with the SAM PuttLab is ease of set up and perfect calibration. Please check out our PuttStation flyer with more detailed information. Using the SAM PuttStation and the FlexTriplet allows you now to set up the putter in seconds. Just clip the Triplet on the shaft and both the putter and the triplet will be calibrated automatically. The biggest advantage to using the PuttStation with the SAM PuttLab is ease of set up and perfect calibration. 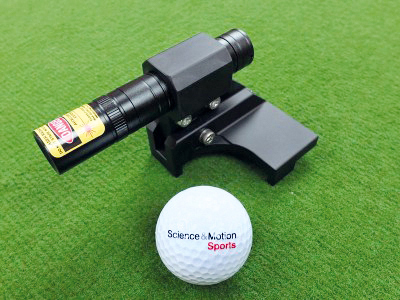 Use of a laser is only needed for the initial setup making change of putters, triplets etc. extremely simple. Once the station is set up in the studio environment, calibration is done simply by holding the putter to the extended calibration ruler/ arm and then calibrating the system as usual. 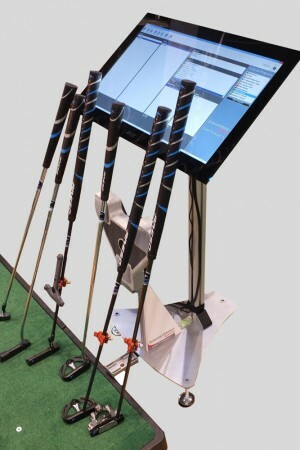 This is very beneficial for putter testing or in case of using PuttLab in a retail / shop environment! The SAM Putting Laser* allows you to easily control the alignment of your putter face to the target/hole. Simply place your putter face against the back of the Putting Laser and review your alignment. 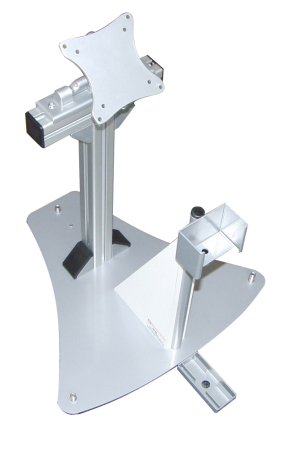 By its special design it can also be used for the fine alignment of the SAM PuttStation and guarantees an accurate calibration of the SAM PuttLab system. The laser is optimized for eye secure indoor usage (red laser class 2). On outdoor usage it might be poorly visible in sunlight. For higher laser brightness please contact us (see info box below). Attach your monitor or touchscreen directly to your SAM PuttStation with the SAM PuttStation monitor extension*. Max. Weight: 10Kg / 22 lb. Path, face angle and centeredness of hit are the crucial factors which affect the direction of any golf shot and these can be improved substantially with the the Perfectstroke Putting Aid. There are at least 26 different ways to use the Perfectstroke System which ensures that practice on the putting green or practice at home is always interesting and challenging. The Perfectstroke Putting Aid is one of the few putting aids supporting a putting stroke that has a slight arc rather than straight back and through. The shaft of the putter moves on plane on a straight suspended rail, but the putterhead will move slightly inside / inside. At the same time the putterface stays square to the path which allows the face to open and close slightly relative to the target line. Developing a feel for speed is the final component crucial for consistent putting. The Perfectstroke TPE Tour Player Edition has a number of additional key features including a very practical elastic line and an aiming cup. It will help to improve aim, stroke mechanics, distance control and green reading. The Perfectstroke base can even be used as a stimp meter. The system comes with a DVD which is hosted by golf professional and commentator Brett Officer and includes a number of very useful drills and exercises which will also help you to develop great feel for distance. The Perfectstroke TPE has found a place in my putter demo days as well as my instruction with both amateur and professional golfers. The Perfectstroke TPE provides perfect feedback on stroke path and impact. I highly recommend this product to both instructors and every golfer. The Perfectstroke TPE is the Best Putting Training aid I have ever seen. I use it 2-3 times a week on real greens at my club, and I have used it to help some of my students understand and feel the stroke better. I have noticed that most of the time the alignment has been the most improved and in turn better alignment makes for better stokes. I love it on breaking putts also and I have noticed that everyone that has used it at the beginning is shocked as to how much break they really have to play to make putts.